Growing up, I had a love for animals but never actually had a dog. As I moved to Iowa from California when I was young, I had cats and fish but still no dog! 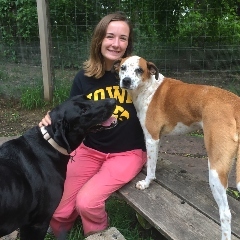 I moved to Iowa City in 2016 to study Nursing at the University of Iowa and started volunteering with the Animal Shelter. While we usually had at least a couple dogs at a time, I wanted to spend more time with them! I found out about Pooch Palace in early 2018 and decided I would take a shot and apply for a job. Every day is different and so much fun! I love giving the dogs a little vacation of their own while their people are away. I hope to own one (or a few) dogs of my own someday!